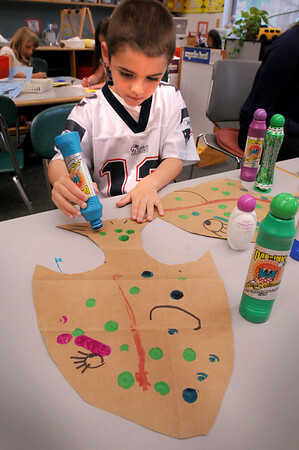 Salisbury: Louis Bishop, 6, decorates the tail of a fish he cut out Thursday afternoon at the Salisbury Elementary School. The kindergartners were learning different things about the Earth's oceans and did some illustrations. Bryan Eaton/Staff Photo Newburyport News Thursday May 28, 2009.